Planning a deck renovation or new deck build? Tuff Industries has your back with the best practices for building waterproof decks that last – keep reading and have a pen ready to take notes! Before your building project gets too far down the line you need to get involved. Why? Because decisions that you make now affect how your waterproof deck turns out. For example, if you’re planning on putting in a hot tub your builder will need to know – as this has a significant impact on the load (and strain) placed on your deck. If you haven’t planned out your landscaping yet, you’ll want to consider the need for drainage – where do you want your gutters to drain into downspouts? 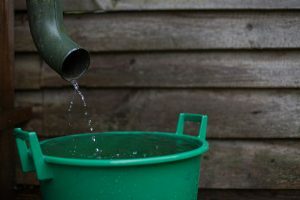 You can plan ahead to have your downspouts to feed into water barrels near your garden, or close to the property line if you have hedges that will need regular watering. Drainage is boring, but really important when it comes to making your new vinyl deck surface last for the long term, as well as ensuring that your home is protected – so take it seriously and start planning early. It’s so simple (and doesn’t cost much) to bump up your deck’s framing – and the benefits far outweigh the slight ding to your wallet. By installing larger joists, closer together you are making your waterproof deck even safer, ensuring long-term stability and keep your deck membrane in top shape for the maximum length possible. After you build a solid foundation for waterproof vinyl decks, think about your vinyl deck surface. Investing in a high-quality PVC membrane ensures that your deck can stand up to water, traffic, UV rays, heat, cold, ice, wind, etc. It’s certainly worth spending a bit more to know that you’re getting the best deck surface possible. Above all, your deck should meet local building requirements, or exceed them. Not doing so can put you at risk of deck failure or cause issues with housing inspections and home sales. The surface underneath your vinyl deck membrane is nearly as important as the membrane itself. For example, using 5/8-inch plywood may meet local building requirements, but you might be able to feel it “flex” when you walk across the deck, especially if you have a few people on the deck. Solution? Using a thicker plywood can easily solve this problem for only a few dollars more per piece. We don’t often give much thought about stairs when designing a waterproof deck; they just sort of…are there. But don’t discount the fact that your stairs and the treads used are an important part of making your deck useable and safe. When you think about how much weight you put on each stair tread, you’ll quickly realize how important it is to ensure that your stairs are well supported and that the treads you use can handle the load. If you are concerned about the load on your vinyl deck stairs, as for an additional stringer to be installed. When the deck ends without a wall, fascia board is used to “finish” the deck. Then flashing can be used so water runs off the deck surface down the front of the fascia (with waterproof deck membranes the surface can wrap over the end of the deck and underneath to provide a fully waterproofed surface). Fascia needs to be regularly checked for looseness, splintering, or rotting as it is preventing water from getting underneath the deck, which could cause damage to the underlying deck structure. Railings on waterproof decks obviously protect from slips and falls, but when they aren’t incorporated into a deck properly can give easy access for water to get under the vinyl deck surface. Rail posts are a common problem area – so ensure that your installation meets waterproof decking standards. Wood posts are a nice touch, but keep in mind that they might have to be re-stained and sealed every year. Otherwise, they might crack and let in water. Before installing a waterproof membrane, your home needs to be protected from watering the housing envelope, or running down between the structure and the deck. The correct installation of flashing prevents both water from the deck getting underneath the deck or house siding, as well as water that might come down the siding (for example, from an overflowing gutter) from getting under the membrane. Flashing is one of the areas where decks commonly run into problems – so ensuring correct installation and maintenance is key to keeping your deck waterproof. There are two roads you can choose when picking out a waterproof membrane for your new vinyl deck – do-it-yourself or professional installation. Primarily this choice hinges on two things: budget and your own installation abilities. Obviously, if you don’t feel comfortable with what’s involved with installing a waterproof membrane, you’ll need help. Ideally, having a professional install your waterproof deck surface is the way to go. So how to you get started with building waterproof decks? Talk to a professional, who can help you with design options or answer any questions you may have. Next, take a look at some of the range of waterproof membrane your deck could use – and imagine the possibilities!